Cyclone Idai is one reason why we’ve heard next to nothing about another huge flood that’s been devastating US states in the Midwest: Nebraska has taken the brunt, but neighbouring states and those bordering on the Missouri are affected, too. This is not about ranking disasters or comparing scales of devastation – there is no ‘worse than’ – for anyone involved it is horrible, life changing and heart breaking. In January the polar vortex, the band of extremely cold air around the artic, expanded south and brought an extreme cold spell to the Midwest. Temperatures dropped to -41°C, and even Lake Michigan froze into a bizarre icescape. There is mounting evidence that the rapidly melting ice cover in the Arctic is responsible for this particular kind of weather pattern. Temperatures remained extremely low through February and in March a ‘bomb cyclone’, a hurricane force winter storm hit the Midwest, followed immediately by a sudden rise in temperature and heavy rain. With the ground frozen solid, the water had nowhere to go. The melting snow added more water which backed up for miles before it could finally drain into a river. And along those rivers, where water levels continued to rise, more and more levees were breeched. 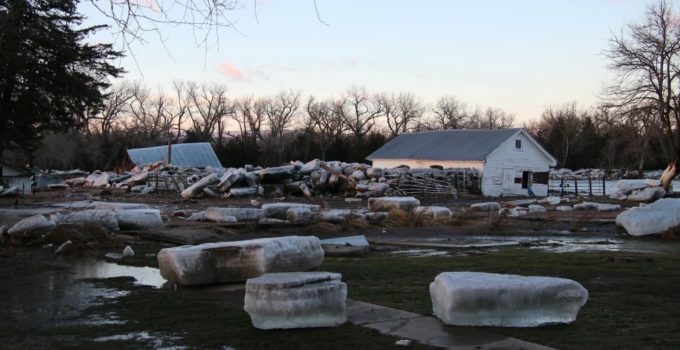 Dams broke, in one instance sending an 11 ft. wall of water across farmland and farms. The force of the water pushed huge blocks of ice inland, shattering everything in their paths or piling up into solid ice walls. In Nebraska alone the damage amounts to well over US$ 1.5 bn. : roughly US$ 400 million each in infrastructure damage (which does not include private homes and businesses), lost cattle, and crop losses. With initially over 1,500 miles of roads blocked, bridges destroyed and railway lines damaged, Nebraska Gov. Pete Ricketts declared a state of emergency. As I write this emergency is still in force in two thirds of all Nebraska counties. The waters are starting to recede but it’s only a temporary relief; Meteorologists are forecasting heavier than normal spring rains. The risk of more flooding, in particular where levees have been breached, will last into May. And only once the water has gone the true scale of the disaster becomes evident. The most heart-wrenching sight is the dead cattle. Calving season was under way or nearly finished. Many farmers now have the horrendous task of retrieving bloated cadavers from wherever the flood deposited them, including hedges and mud banks. The water has swept away topsoil, left debris – from whole trees to all kinds of junk – and carved wide gullies into the farmland. Normally field work would start in the next few weeks and in May the planters would be rolling. But a lot of machinery has been damaged through water, too. Drying it out and repairing the kit may take weeks. Which may be just as well – thousands of aces might not be planted at all this year, one farmer was quoted as saying, that even if there were nothing but sunshine until June the soil wouldn’t dry out well enough. The force of the water was such that whole grain bins were swept away. Where the floods rose more slowly, the stored grains are now wet and expanding, threatening to burst the bins. Because of Donald Trump’s on-going trade war with China, farmers held on to record amounts of soy, corn and wheat, hoping for prices to pick up. A lot of the grain that was stored on farms is now lost. Farmers are trying to salvage what they can, insurers may cover some of the losses, federal disaster relief may help – but farm incomes are at a record low and it will take an enormous effort to rebuild. And rebuilding the soil, the basis for food production, will take years. Farmers who worked with cover crops may have had some protection but no management practise can protect cropland or pasture from damage caused when a ‘river’ suddenly sweeps through. Have a look online for ‘Nebraska floods 2019’. That’s what we’re all in for with climate change. And it’s farmers who grow our food. What that looks like you see in the photo of the Ruzicka farm in eastern Nebraska. It was taken by Lorie Kreycik Knigge who kindly gave us permission to use it.